Our Greenwich minibus hire serves groups of all sizes on leisure or business trips around this historic region. We can take care of any transportation needs that you have and will get you safely to any destination in the area. Our excellent standards of customer care and punctuality have helped to make us leaders in the sector. Greenwich is a famous World Heritage Site and is known across the globe for the Greenwich Meridian, which is used to establish Greenwich Mean Time. We pick up many overseas visitors from the nearby airport and also transport residents to the airports when they are traveling to other parts of Europe. Our clients turn to us whenever they need to ensure that they will catch a flight on time and trust us to take them home safely whenever they return. There are so many beautiful things to do and see in Greenwich. We can carry you from your hotel to a central location from which you may easily stand on the Prime Meridian and then walk to several important landmarks around the city. if you only have a day and need to see several attractions, our buses are fitted with toilets, overhead lighting and other conveniences which make it easy for you to spend several hours travelling in comfort. Clients trust our experienced drivers to get them to their functions without a hitch. When you make a booking via our website, we plan a route that helps you to avoid all traffic obstructions. Since your safety is our chief concern, we make sure that we can drive at moderate pace and still reach your destination with enough time to spare. If you require our help with airport transfers you never have to worry that late flights or delays will be an issue. We monitor all flights for our guests so that we always arrive on time for you and you do not have to pay any unnecessary fees. Our Greenwich minibus hire rates are better than those that you would pay for hiring multiple airport taxis and we offer you peace of mind. All of our buses are from brands which are highly regarded. 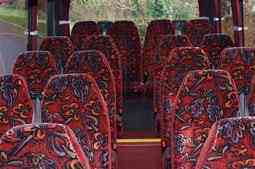 We offer Iveco coaches, Ford Transit vans and luxurious tinted Mercedes 16 seater buses. Volvos from our fleet will transport you to your destination in style. 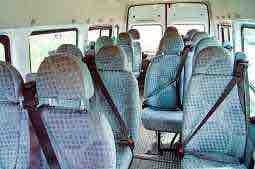 We always provide each coach with a trusted driver who has your safety as their top priority. All of our drivers are fully licensed and are familiar with the city. Our buses are regularly maintained and are checked before every trip to ensure that they are in top condition for any journey. When you have small groups of less than 20 people, we offer several choices to you, so you always have enough room for all of your friends or relatives. If you are attending a wedding, graduation or another important function with more than 50 people, we have a great selection of buses is available as well. 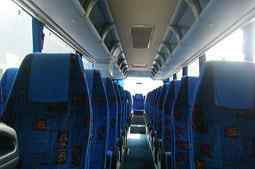 Each coach is fully air conditioned for your comfort and seats can be adjusted to suit you, so you may rest during the journey. If you wish, you can make use of the audio visual equipment available on board. Some of our guests prefer to turn on the overhead lights provided with their seat, in order to prepare for business presentations. Other clients play soothing music after a funeral or relaxing tour. Simply enter information on your arrival point, departure time and the number of passengers in your group and we will take care of planning your trip. You can make a booking using any mobile device while you are on the go. As such, you can send your information to us in minutes and get a free quotation. You get the best quality of service with our minibus hire in Greenwich and our prices are always designed with your needs in mind. Whether you need to travel a far distance or have a quick trip in the city, contact us first. Our knowledgeable team members can help with planning your trip so you can relax.